I had stitched this mini cushion just for me but some friends saw it and wanted one for themselves so I produced a kit of this design and launched it in my shop. And I'm very glad I did as it is very popular at the moment. I guess it must be the vibrancy of the colours and pattern. My stitching diary is very full this month. I'm about a third of the way through stitching my Spring kitten picture (and by the way, I'm thinking of naming this one Molly). And I've designed 3 of the Flowers of the Month mini cushions and stitched one of them. I plan to launch that range two kits at a time, so I'm hoping to launch the January and February kits near the end of September. But that date may change as I'm tinkering with an idea for another Christmas range of designs - but I can't get the sketches just right. On and off I've also been working on my first full-size cushion design. I've had it drawn out for ages and I keep doing a little bit of stitching on it. I've also stitched another little project for a magazine commission. My next published commission will be appearing at the end of this month which I'm getting very excited about. I shall post more details about it at that time. Looks really good! I like your style! Hi Sheena. I just found you through creative connections. 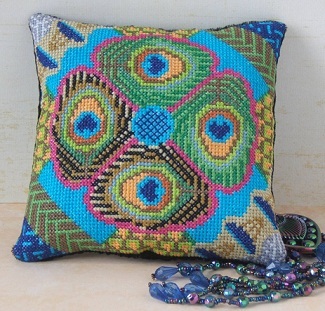 Your cross stitch pillows are a real art.